Oak Refrigeration have secured the order to supply, install and commission a 20 fan coil order for a new large manor house being built in Wolverhampton. The system will utilise the latest R410 VRV inverter controlled system from Mitsubishi which will provide the end user with flexibility and energy saving facilities. 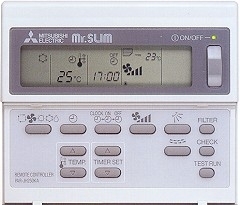 Each room shall be complete with a separate controller to allow the occupants to select a separate temperature per room. Utilising the speed controlled compressors will also allow the system to trim the delivery air temperature in each area to provide a close control. Oak also incorporated within the design a close control, low noise concealed system for the media room which a small screen cinema will be installed. 10 of the 20 indoor fan coils will be concealed within the structure of the house to meet the interior designers brief. These units will be accessed for future maintenance by the incorporation of special seamless hinged panels designed and installed by the main contractor.